Even within the Anthroposophical Society and movement, people's relationship to Rudolf Steiner is weakening and dissipating. This is problematic, says Prokofieff, as the future of both the Society and movement is dependent on a sufficient number of people aspiring to and realizing a true spiritual connection with anthroposophy's founder, Rudolf Steiner. Prokofieff deals in detail with the issues surrounding this concern, and asks the question, "Can one be an anthroposophist without being Rudolf Steiner's pupil?" In the second part of this book Prokofieff elaborates on the mysteries surrounding the laying of the spiritual Foundation Stone at the Society's Christmas Meeting of 1923-24. This event, he suggests, ensured that a personal relationship to Rudolf Steiner "would not remain within the realm of the generally abstract or intellectual, but would become a real inner deed". Thus Rudolf Steiner gave each of us the possibility of connecting with him by way of free inner work on the Foundation Stone. Both parts of this book are integrally linked in the sense that once a relationship to Rudolf Steiner is established, an inner longing to work with the new Mysteries will inevitably follow. 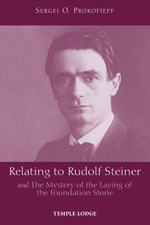 In Prokofieff's words: "... the will to take the foundation of the New Mysteries seriously leads to a real, inner connection with Rudolf Steiner". Also included is an important essay that assesses the difficulties connected with the recent digital publication of Rudolf Steiner's most important esoteric texts, as well as the occult background to the internet and electronic media as a whole. In response to readers' questions as to how one might counteract the damaging consequences of these developments, the author has expanded and developed his original essay on the subject. SERGEI O. PROKOFIEFF, born in Moscow in 1954, studied painting and art history at the Moscow School of Art. He encountered anthroposophy in his youth, and soon made the decision to devote his life to it. He has been active as an author and lecturer since 1982, and in 1991 he co-founded the Anthroposophical Society in Russia. In Easter 2001 he became a member of the Executive Council of the General Anthroposophical Society in Dornach. This is his twentieth book to appear in English translation.